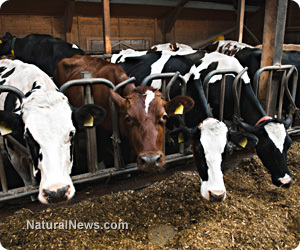 (NaturalNews) The environment, humans and now the cattle raised for food -- the horror that is glyphosate apparently knows no bounds, as a new study out of Denmark shows that dairy cows everywhere are now being harmed by the pervasive agricultural poison. According to this latest indictment of the Monsanto-owned chemical, glyphosate, the primary active ingredient in Roundup herbicide, was identified in 100 percent of urine samples collected from dairy cows all across Denmark, the health implications of which are immensely sobering for both the animals and humans. Dr. Monika Kruger and her colleagues from the University of Leipzig in Germany and Minoufiya University in Egypt presumably did not expect to find glyphosate in every single urine sample they collected for analysis as part of their study. But as they say, the data speaks for itself, and it illustrates just how ubiquitous this extremely toxic crop herbicide has become throughout the environment. In every instance, it turns out, dairy cows were found to have glyphosate not only in their urine but also in their blood at levels that suggest serious cell toxicity. Published in the Journal of Environmental & Analytical Toxicology, the new study took a close look at 30 dairy cows from eight dairy farms across Denmark. Urine samples were collected from all the cows and tested for parameters indicative of cytotoxicity, which include substances like alkaline phosphatase (AP) and creatinine kinase (CK). The team also looked closely at cholesterol levels as well as concentrations of the vital trace minerals manganese (Mn), cobalt (Co), selenium (Se), copper (Cu) and zinc (Zn). After analyzing the results, it was determined that all the cows had some level of glyphosate in their systems. Many of these same cows also had varying types and degrees of organ damage, including damage to their livers, kidneys and muscle cells. High urea levels detected in many of the cows suggest a potential nephrotoxic, or kidney-poisoning effect from glyphosate, while observed mineral depletion suggests similar damage. "Correlations between glyphosate and some of the measured blood serum parameters to CK, Se, Co and Zn demonstrate that glyphosate is toxic to the normal metabolism of dairy cows," concluded the researchers. "This study gives the first documentation to which extent Danish dairy cattle are exposed to glyphosate and its impact on different blood parameters." As to why trace mineral levels in glyphosate-poisoned cows are typically deficient, researchers believe it may have something to do with the known chelating properties of glyphosate. When sprayed on crops, glyphosate seeps into the ground and literally binds important trace minerals like Co and Mn, rendering them unavailable for both plants and the animals that eat these plants. In the end, cows that graze on glyphosate-poisoned pasture end up becoming mineral deficient. In other words, glyphosate is not only directly poisoning cows exposed to it -- in this case, Danish cows are being exposed to it through imported GMO feed, as GMOs are no longer grown in Denmark -- but also robbing the ground of the nutrients needed for their proper growth and development. The end result of this, of course, is chronic illness for the cows, potentially tainted milk for humans and ultimately more sickness and death for everyone, which all points to one thing: that Monsanto's reign of terror over agriculture needs to end.